The Itinerant traders of London. Georgian era. BAKING and Boiling Apples are cried in the streets of the metropolis from their earliest appearance in summer throughout the whole winter. 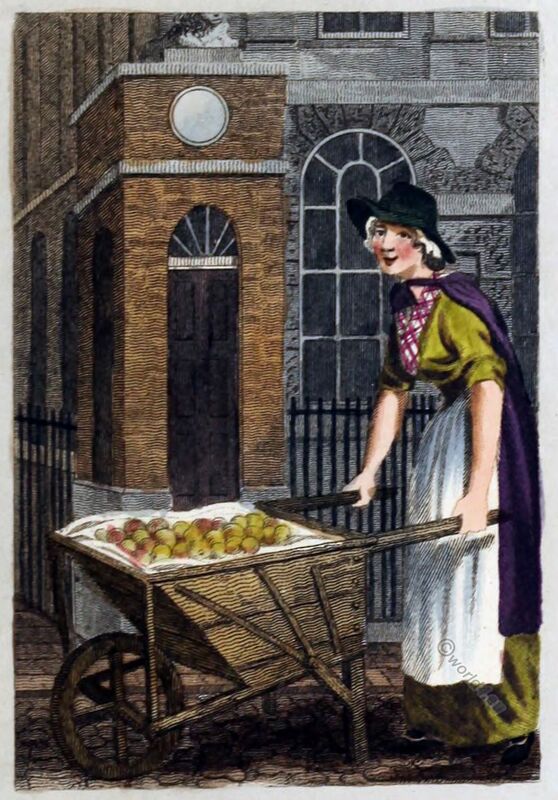 Prodigious quantities of apples are brought to the London markets, where they are sold by the hundred to the criers, who retail them about the streets in pennyworths, or at so much per dozen, according to their quality. In winter the barrow-woman usually starions herself at the corner of a street, and is supplied with a pan of lighted charcoal, over which, on a plate of tin, she roasts a part of her stock, and disposes of her hot apples to the laboring men and shivering boys who pass her barrow. STRATFORD PLACE, the scene in the Plate, is on the north side and near the west end of Oxford-street. It has no thoroughfare; the lower stories of the houses, which are lofty and handsome, are built on a regular design, and faced with rustic stone-work. The house at the north end, facing towards Oxford-street, was lately the property and residence of the Earl of Aldborough, whose family name is Stratford, but is now occupied by the Duke of St. Albans. The late Lord Aldborough erected a pillar in the form of a candlestick, surmounted with a most disproportioned statue of his Majesty, at the upper end of this place. This triumphal monument, if it deserved that name, was erected in honor of several memorable victories, and built of a composition resembling stone; but it is already nearly destroyed, two sides of the railing being pulled down, and the inscription, which recorded the cause of its erection and the titles of his Lordship, almost defaced. Barren as London is of the classic decorations of statues. and public monuments, we cannot wish to see the pillar of Stratford-place repaired upon the same inelegant and puerile design in which it ‘was originally executed. The object was however good. Source: Description of the plates representing the itinerant traders of London in their ordinary costume: with notices of the remarkable places given in the background by William Marshall Craig; Richard Phillips. Modern London. Publication date 1804. Publisher: Richard Phillips.